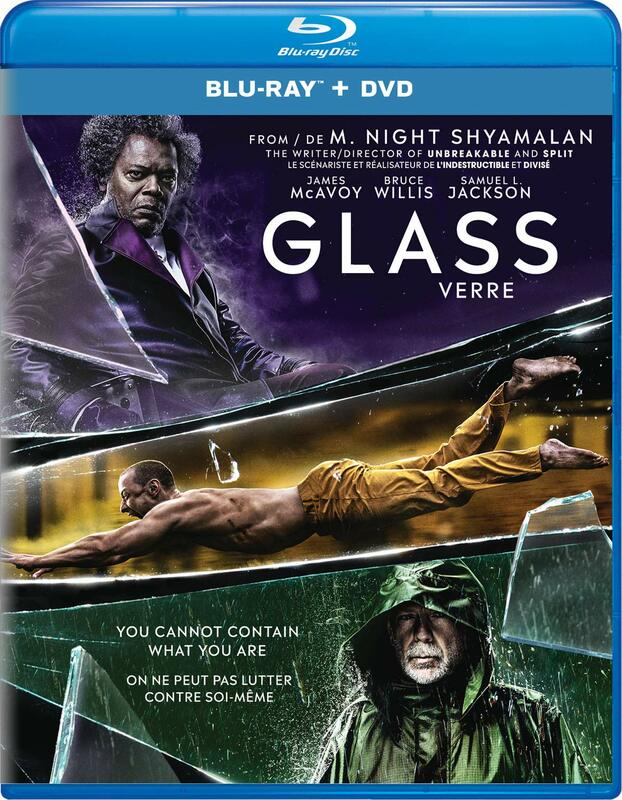 M. Night Shyamalan’s Glass serves as an interesting and somewhat unexpected conclusion to the unlikely trilogy that the filmmaker started with Unbreakable in 2000 and its surprise sequel Split in 2017, bringing together characters from both films for a final showdown. Nineteen years after becoming the sole survivor of a train crash and discovering his supernatural abilities, David Dunn (Bruce Willis) now runs a home security business with his son Joseph (Spencer Treat Clark) while moonlighting as a cloaked vigilante, using his powers to track Kevin Wendell Crumb (James McAvoy). Kevin has kidnapped four cheerleaders and is holding them captive in an old factory. His two dozen personalities are still fighting for control of his body, with the Beast trying to come into the light and fully take over, giving him superhuman abilities. When both men are captured by the police, they are taken to Raven Hill Memorial Hospital, a mental institution where Dunn’s nemesis, the superhero-obsessed mastermind Elijah Price (Samuel L. Jackson) who believes that comic books are actually documents of forgotten history, is also being held. Given the name Mr. Glass, Elijah uses a wheelchair so his brittle bones don’t break, and is kept heavily medicated into a catatonic state, to prevent him from influencing the other patients. The three men are kept in secure rooms and are being watched over by Dr. Ellie Staple (Sarah Paulson), a psychiatrist who studies people with the delusion that they are superheroes, and is trying to convince them that their perceived powers are not real, and just the result of insanity. Bridging the gap between the quiet, introspective tone of Unbreakable and the pulpy thrills of Split, (a film that I enjoyed when it first came out but also judged a bit too harshly at the time and have come to appreciate even more as part of the series), Glass offers an intriguing continuation of both stories that delves deeper into the first film’s idea of what goes into creating a superhero or a supervillain. This film really explores the individual psyches of these characters, and it works thanks to the strength of the actors who are portraying them. It’s great to see Willis this involved in a project again, and he delivers a well fleshed out performance, stepping back into the role that he first played nearly two decades ago and reprised for a brief cameo in Split. Jackson is also given a meaty role, and in many ways his character is really able to step into the spotlight here. McAvoy delivers another incredible performance that builds upon the impressive acting showcase that he was given in Split, brilliantly shifting between Kevin’s distinctly different personalities who vary in age, gender and ability, sometimes within the span of a few moments. The most interesting thing about Glass is that it is actually a very psychologically driven film, which makes it feel somewhat unique and daring for a big studio release. The majority of it unfolds within the hospital, and focuses as much on the inner workings of its characters as it does on delivering thrilling action scenes. The tone is set by an eery, ticking clock score courtesy of composer West Dylan Thordson that is reminiscent of John Carpenter’s synth work, and Shyamalan does a fine job of building suspense towards the big showdown in the film’s climax, which he stages quite well, with his signature twists and turns keeping us on edge throughout. The notoriously divisive filmmaker takes the story in some interesting directions near the end of Glass that have divided even fans of Unbreakable and Split, but the choices that he makes here mostly worked for me. This is a philosophical take on the superhero blockbuster that offers a clever deconstruction of the genre, connecting these two very different films in intriguing ways. No, it won’t be for everyone, as the largely poor reviews and mostly mixed audience reactions suggest, but I have a feeling that in time Glass will come to be appreciated alongside the first two films for the risks that it takes. The Blu-ray also includes an alternate opening and a dozen deleted scenes, which feature optional introductions by Shyamalan. These are followed by twelve featurettes, entitled The Collection of Main Characters, A Conversation With James McAvoy and M. Night Shyamalan, Bringing the Team Back Together, David Dunn vs. The Beast, Glass Decoded, Breaking Glass: The Stunts, Connecting the Glass Universe, M. Night Shyamalan: Behind the Lens, The Sound of Glass, Enhancing the Spectacle, Raven Hill Memorial, and Night Vision. Glass is a Universal Pictures Home Entertainment release. It’s 129 minutes and rated PG.